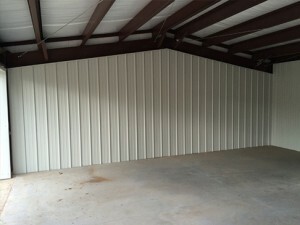 Metal construction offers the perfect solution when it comes to building workshops and garages for a number of reasons. These include superior strength and durability so that your articles, including valuables such as cars, motorcycles, recreational equipment, etc., are fully-protected from the elements. Metal buildings also offer excellent protection against fire and theft, and are highly resilient to infestations by insects and other pests. One of the biggest benefits though lies in the fact that buildings made from pre-fabricated metal components can be assembled quickly, making them very economical, but with excellent value for the money. True, metal buildings can “sweat”, i.e., the effect of condensation, depending on season and climate, but there are a number of options available that can eliminate this problem. 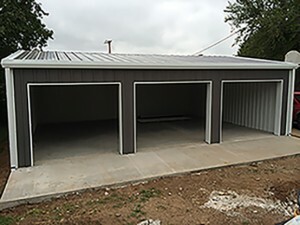 At M44 Building Company, we have 15 years of experience assembling structurally-sound and secure metal buildings of all types, including workshops and garages. Our consultants will take your storage and/or workshop needs as well as your budget into account, and help you to come up with the right design for you. Your garage or workshop will be built from high-quality pre-fabricated components sourced from Canadian and American suppliers and assembled on-site by a highly-trained crew. Contact us today and we’l l help you create your ultimate workshop or garage (or man-cave) – all you’ll have to do is fill it with “toys”. 1-877-697-7444 for a free quote.